I went to my local Costco yesterday and found an awesome new treat. Justin’s Dark Chocolate Peanut Butter Cups. They are organic, gluten free, dairy free, and vegan. They are individually wrapped so you eat one at a time, not two, and they are only 80 calories a piece! I have fallen in love with these delicious chocolates. They just taste so much better than Reese’s Cups! The chocolate is excellent quality fair trade. The peanut butter tastes more like peanut butter and less like sugar. This smooth, rich peanut butter cup melts in your mouth. I’m always looking for dairy-free chocolate bar options. I once read the ingredients on every chocolate selection in a Walgreen’s Candy aisle (no joke), trying to find something without dairy! The closest thing I found was a bag of dark chocolate peppermint patties, and they still had some kind of dairy ingredient in them. Let’s face it, the candy bar world is just not lactose intolerant friendly. I was so happy that my Costco had a dairy-free chocolate option…but they still only carry my favorite chocolate covered macadamia nuts in milk chocolate. Let me digress on the lack of lactose intolerance awareness within grocery stores. Gluten free is very big right now. Grocery stores everywhere are developing their own gluten-free products and selling them in special gluten-free sections of the store. I have yet to see a dairy-free section in a store. When you are used to being lactose intolerant, you learn where to look to find your favorite dairy-free and lactose-friendly brands. But for those who are just discovering their intolerance to dairy? It can be tough to find things in a regular grocery store. Non-dairy milk products like soy milk and almond milk are easy enough to find, but what about dairy-free cheese, dairy-free soups, or dairy-free frozen entrees? There are more and more options coming available, but they are spread out all over the store. You have to hunt and read ingredient lists to find anything. Dairy free is not a common label actually. Even these peanut butter cups are not labeled dairy free. They are vegan, which means the same thing, but I just want to take this moment to yell at the top of my lungs…NOT ALL PEOPLE WHO CAN’T EAT DAIRY ARE VEGAN! I’d love to keep on blogging about some of my favorite dairy-free products. If you have any questions on something you are looking for, or if you would like to know of an excellent dairy-free candy, snack, meal, or dessert product, please leave me a comment! I’ve gained a lot of experience over three years of trying to satisfy food cravings. Another thing to remember this Halloween, if you or your child has a dietary restriction, please give out a nut-free, gluten-free, or dairy-free (insert other dietary restriction here) candy this Halloween! If your child collects a ton of Halloween candy that he or she cannot eat due to dietary restrictions, consider donating it to someone who will appreciate it a lot, such as our troops overseas. Here is some information on how to donate through Operation Gratitude. BTW troops love good quality dark chocolate! Also, see if your local children’s hospital, food pantry, or women’s shelter is accepting candy donations this year. We had a ton of roasted cashews that we weren’t eating, so I decided to turn them into something we would eat. Most cashew cream or cheese recipes I’ve been wanting to try call for raw cashews, so I couldn’t make any of these. Trail mix left me with kind of the same problem, and granola bars seemed kind of a blah idea. I know, I know– everybody loves granola bars except me. It’s not that I don’t like them, I just don’t love them. 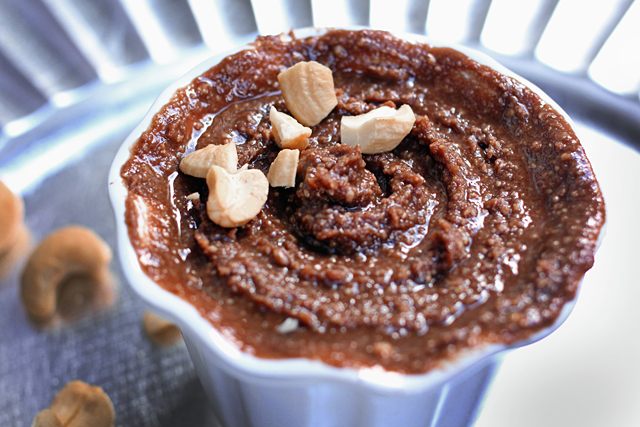 I started thinking about how I’ve been meaning to make a dairy free version of Nutella, and then it occurred to me: I bet roasted cashews would make a really delicious chocolate cashew butter. Go! 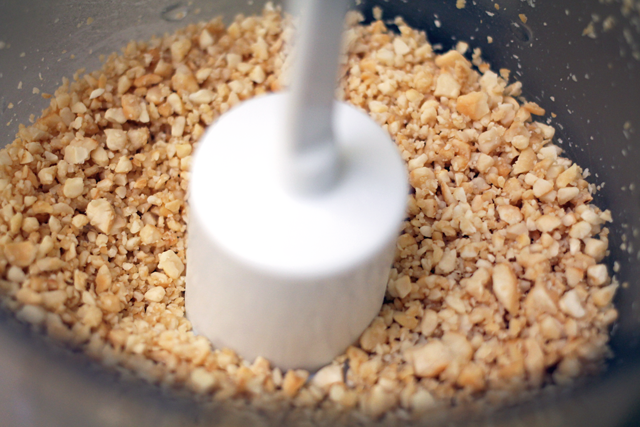 First I pulverized the roasted cashews in my food processor, then added vegetable oil, white sugar, and cocoa powder. You can definitely add a sweeter oil to yours, like a nut oil. I just like to use what I have in my kitchen already. I did have a little trouble getting this to be low sugar and still taste like chocolate, but with some experimenting and taste testing, I eventually got a good flavor balance. 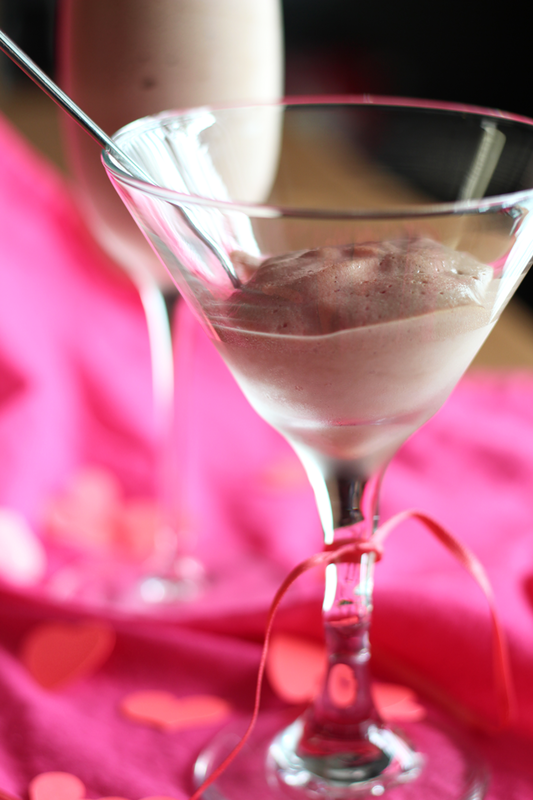 It’s sweet but not too sweet, with a buttery, chocolate flavor. YUM. I suppose I could have kept processing it to make it smoother, but I’m impatient. My food processor is not the greatest and it was taking a long time. Feel free to make yours into a smooth-and-shiny-as-Nutella-butter….or mix in some bigger cashew pieces to make a crunchy butter! This is great for spreading and dipping. 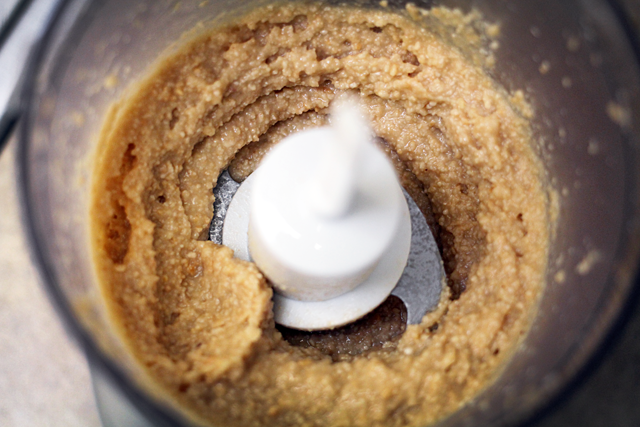 Spread on graham crackers or croissants, or make a cashew butter and jelly sandwich. I ate most of this batch as a dip with salted pretzels, which was so addicting. It was one of those snacks where you eat a few and you’re like, okay, just one more, then that one more turns into an empty bag of pretzels and a need to buy more cashews. 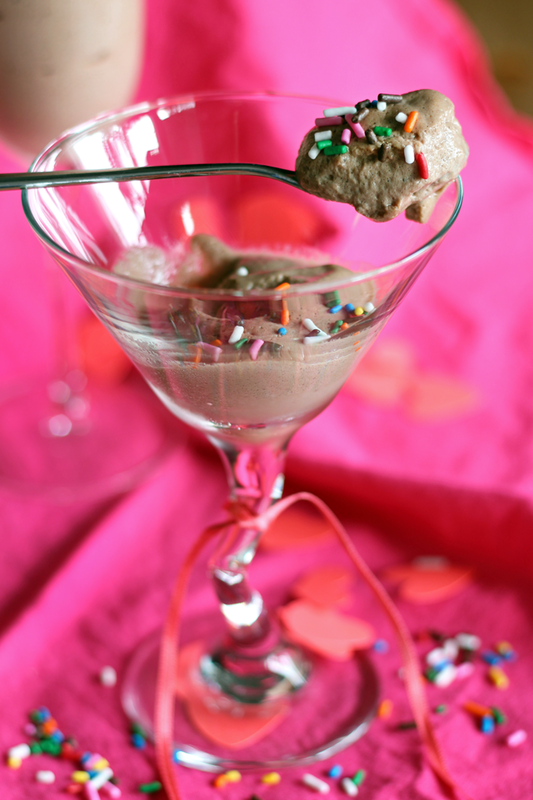 I hope you enjoy this simple chocolate cashew butter as much as I did! 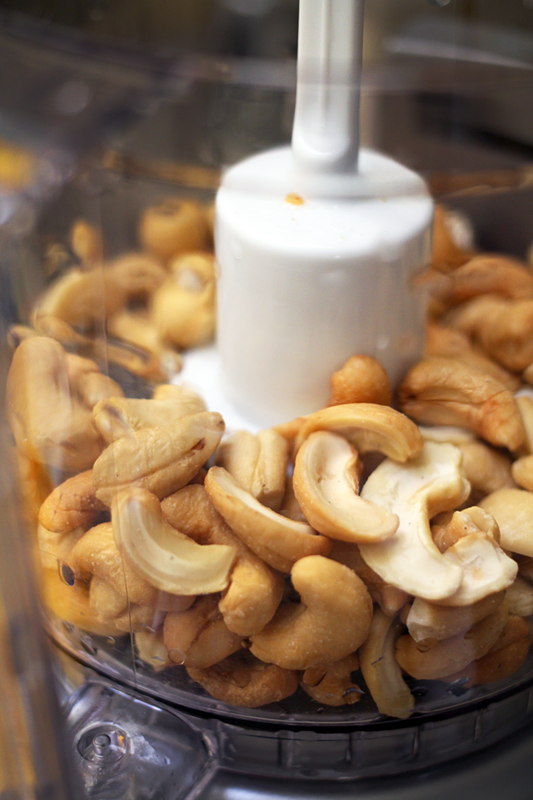 In a food processor, grind your cashews until finely chopped. Add oil and process until smooth. Add vanilla, cocoa powder, sugar, and salt, then process until well combined. 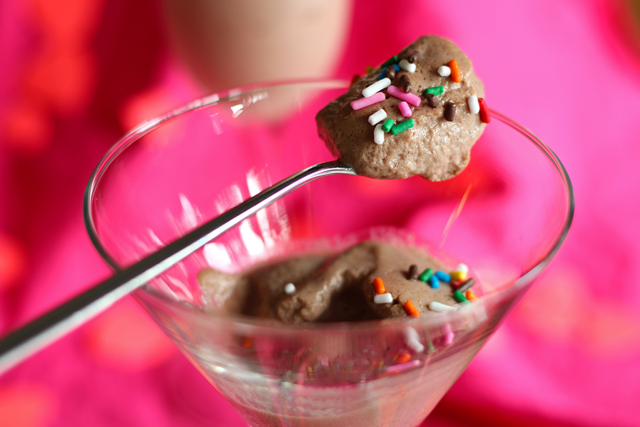 Taste, and add more sugar or cocoa powder to your liking.